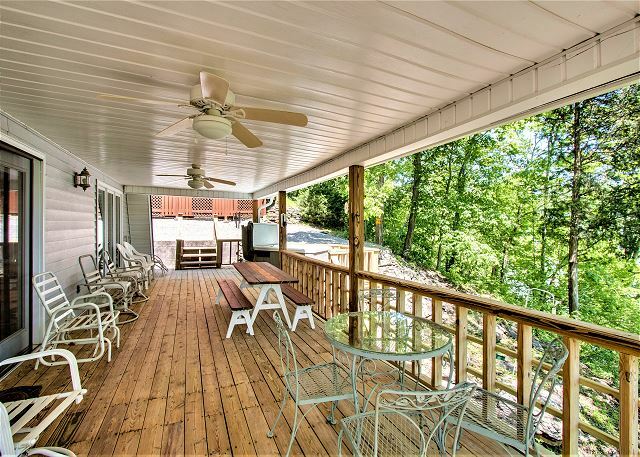 Smithville, Tennessee United States - Henry's Hideaway | Center Hill Chalets Inc.
Home has a awesome view of lake, even from hottub! Very clean and everything you need for a great time. Staff at Center Hill were very helpful and quick to respond to your requests. Henry's Hideaway is a great place!! Thank you for your wonderful review, Howard! We are thrilled that you enjoyed your stay at Henry's Hideaway. We hope you will stay again very soon! We really enjoyed the deck. Built a couple of fires in the little pot belly. Enjoyed the hot tub every evening.The beds could have been a little more comfy but we knew they were doubles when we rented.Had all the utensils needed to cook up some great meals. Close to all the places we wanted to explore. Thank you for your review, Kathryn. We are thrilled that you enjoyed your stay at Henry's Hideaway. We hope you will stay with us again very soon! The house is exactly as pictured. 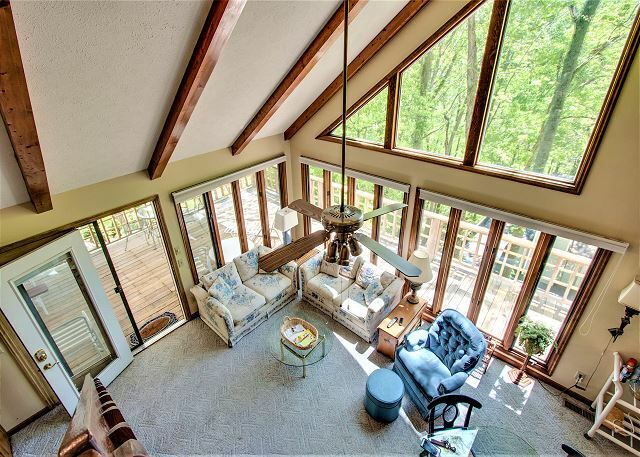 It has a great view of the lake. The road and driveway were a bit narrow. The management team are great to work with, if you have any issues or questions. We plan to stay at this house again. Thank you for your review, Gaye. We are thrilled that you enjoyed your stay at Henry's Hideaway. We look forward to hearing from you again. 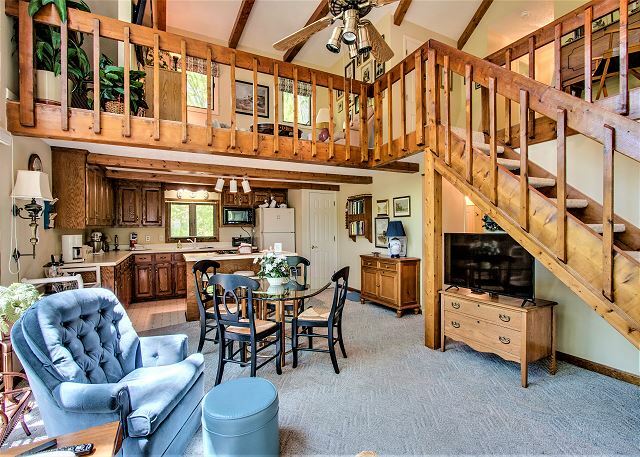 This cabin was just like we imagined. We went there for a girls trip for my birthday and the views and the hot tub were the perfect way to relax. THere are nearby trails that are quick driving distance and easy to find. The driveway is a little scary to drive up at first, but other than that, no complaints. It smells like a real life vintage cabin or trip to grandmother's house as well, so you may want to bring a diffuser if that bothers you. I recommend this place thought! Thank you for your review, Calah. We are thrilled that you enjoyed your stay in Henry's Hideaway! It really has that true cabin feel about it. What was your favorite hiking trail? We hope you will come and stay with us again soon. This property was perfect for our group. Easy access to Hurricane Marina, as well as boat access right around the corner. Beautiful views. House is cozy, but big enough for a group. Thank you for the great stay. Thank you for your review, Lauren. We are so happy that you enjoyed your stay at Henry's Hideaway. We hope you will stay with us again soon! The cabin was very nice and overall we had a fine time. Very secluded site and it was nice to have the lake a short walk away. Great view ... lots of green. Had a little problem connecting to the wifi at first. Having the password and wifi name in a more prominent place would be a good idea. We were able to get to the cabin fine, but someone with a big camper or trailer could have a pretty harrowing adventure on Puckett Point road. A semi-truck got stuck on the s-curve one day and we had to park our cars and walk down. A wrecker had to come and winch the truck up the hill. Water pressure was a little low -- that may come with the location. Overall, though, a very nice place. Thank you for your review, John. We are gald you enjoyed your stay. Yes, that driveway is tricky. The best way to approch the driveway is to go to the lake and turn around to go into the driveway. We hope you choose to stay with us again. This is one of the cleanest chalets at Center Hill that we have experienced. We cooked every night and the kitchen had everything that we needed. The grill was great too. Make sure that you have all wheel drive or 4 wheel drive to pull your boat in and out of this ramp. It is steep and tricky. Thank you for your review, Sheryll. 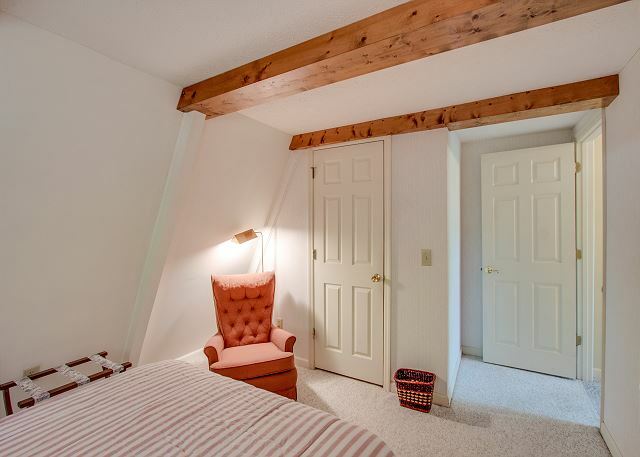 We are glad you enjoyed your stay at Henry's Hideaway, and we hope to see you again soon. The home was clean, the kitchen well-stocked, and the 8 of us never felt crowded. We brought our boat and the boat ramp is very close which was nice. My only complaints are that all the knives are very dull and need to be replaced, the full size beds are really small for two people, and the road to the boat ramp is very narrow and taking our pontoon boat down there was pretty hair-raising. The driveway to the home was also narrow and kind of scary especially at night. Thank you for your review, Jennifer. I do agree that the road is very narrow to Henry's Hideaway, but the view along the road is breath taking. We are glad you enjoyed your stay, and hope you come back to vacation with Center Hill Chalets again! We had a great time at this lovely cabin. Everything was clean and tidy and just as described. The views are incredible - the photos just don't do it justice. We wish we could have stayed longer! Would highly recommend!!! One thing to be aware of (not an issue, but just for future reference), the driveway is steep and narrow! Be careful driving in the dark! Overall, we LOVE Henry's Hideaway! Thank you for your review, Cora! We are looking forward to your next stay with us! The house was great, beautiful view and spacious clean house, I would recommend and stay again. We are glad you enjoyed your stay at Henry's Hideaway! Thank you for your review! We are glad you enjoyed Henry's Hideaway! The lake is absolutely gorgeous in that area, especially with Henry's Hideaway view. We look forward to your next visit! Thank you for your review! We did have an issue with the hot tub after the first night, but all it took was 1 call to the management company and they had it fixed the same day. We are glad you enjoyed your stay and we were able to correct the hot tub issue. We look forward to your next visit! Thank you for your review! My kids and I stayed here for a weekend and we loved it. The house was well stocked and the communication was fantastic. The view is amazing to wake up to each morning. We would love to stay here again. We are glad you enjoyed your stay with us! Henry's Hideaway is a true treasure on the lake! We look forward to your next visit! Incredible view, and nice property. We'd like to come back for the fall foliage. Only complaint we had is that the beds were small. We are glad you enjoyed your stay and look forward to your next visit! We enjoyed a great family reunion at Henry’s Hideaway; centered around the Great American Solar Eclips. Center Hill Chalet management was great resolving last minute scheduling changes and went out of their way to make sure our trip was a success. 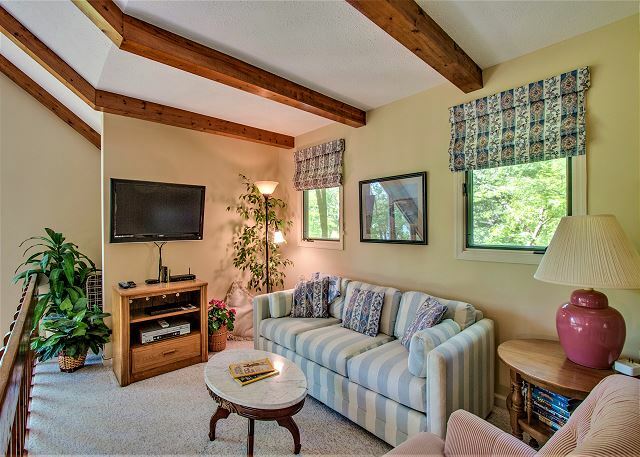 The property was clean, was well-maintained, and had a great view of the lake. It was just a short drive to Smithville to pick-up those few items we forgot to bring. 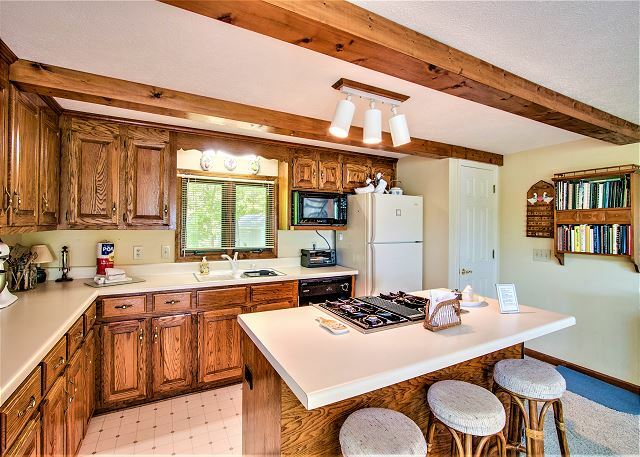 Kids and grandkids loved the amenities; and the short walk down to the lake. The whole family congregated Lakeside for an ‘eclipse party picnic’, swimming, and kayaking. We had a wonderful time and would recommend Henry’s Hideaway to friends. We are glad you enjoyed your stay and look forward to your next visit! Thank you for your review! 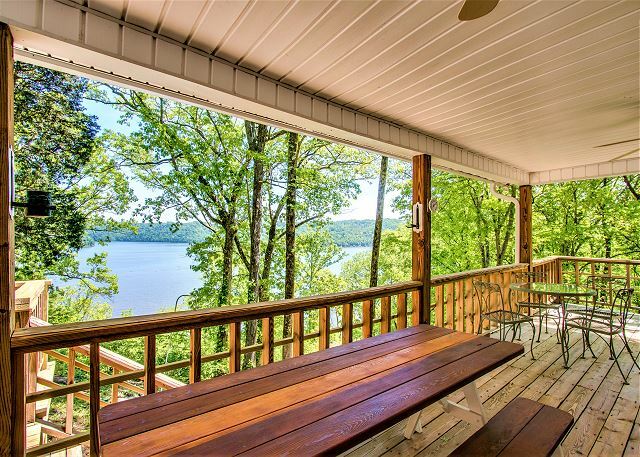 Usually when you stay in a cabin at the lake, you either get a great view OR convenient access to the water. However, this place had them both!! I can't say enough about this rental!! It was perfect!! You could tell that the owners love their lake house. The kitchen was the most well stocked kitchen I've ever seen in a rental. The house had absolutely everything you'd ever need and even things you wouldn't anticipate needing...until you needed it...like flashlights and/or lanterns in every room (with fresh batteries, which were lifesavers when a storm rolled through and knocked out the power). Spectacular view of the lake, very convenient lake access with a very private beach area, right next to two coves to safely swim and paddle around in our kayaks without fear of boat traffic. This place was PERFECT and we will absolutely be staying here again! The absolute ONLY thing that we ended up needing that wasn't there was a toilet plunger. LOL! We are glad you enjoyed your stay! Henry's Hideaway is a treasure on Center Hill! We are glad you got to enjoy the house and the lake. We look forward to your return! We will get a plunger for the house. :) Thank you for your review!